On March 4th, 2013, Jim and Dr. Gemie (Kohler) McLeod opened Innate Wellness & Medical Center, currently located just north of YRMC on Ainsworth Drive. After an abrupt and unforeseen closure occurred at the medical office Dr. Gemie previously contracted with, the couple decided to open their own naturopathic health and well-care office to ensure that patients could continue with uninterrupted care and services. “We had actually started to talk about venturing out as entrepreneurs and had began to look for an office of our own just days before. It’s amazing how everything happened all at once…out of one office on Thursday and into our own office by the following Monday. We definitely realized that the date, March 4th, was significant because ‘marching forth’ was the only option we felt we had. I am grateful for the divine help and team of people that came together as one to make it all work out,” states Jim, who currently manages the office. Dr. Gemie grew up in a small Mid-western town in Northeast Wisconsin called Combined Locks. Her love of science and nature blended with the compassion to help people put her on the path to becoming a physician early on in life. She was a collegiate athlete and excelled both in the classroom and on the playing field. “I was a pitcher on my college softball team and really credit much of my success personally and professionally to coaching and experience as a high-caliber athlete. It certainly taught me how to manage myself as a leader, and created the work-ethic and dedication to teamwork and community needed today as a physician,” says Dr. Gemie. In pursuit of medical school at age 21, life took a major turn and she became a mother instead. 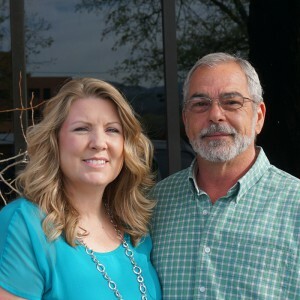 “God has a great sense of humor and had a much better plan for my life…raising my two daughters was the best education and preparation I could have had.” After the premature passing of both of her parents, she was determined to pursue her dream to become a doctor so she returned to medical school and completed her training at Southwest College of Naturopathic Medicine in Tempe, Arizona. Jim was raised in the Phoenix/Mesa area but lived many years in Washington state before relocating to Prescott in 2008. He is a natural problem solver and brings several years of managerial experience to Innate Wellness & Medical Center. The couple met in 2011 and married in 2013. Together the McLeods have a blended family of 6 amazing kids and 5 grandchildren. Over the last three years, Innate Wellness & Medical Center has continued to prosper and to expand goods and services to meet the needs of those seeking a more holistic approach to their health and well-care needs. The development and execution of well-care protocols and treatment plans that fit the patient’s goals, needs and lifestyle are vital to the success Dr. Gemie has achieved. She explains, “I am a Naturopath, and Naturopathic Medicine is the medical science of nature. It is a system of natural healing that views the body as a whole and each person as individuals. This approach integrates the latest discoveries in biochemistry, physiology, genetics and diagnostic advancements with the prescription of nutritional, herbal and homeopathic medicines. I also use other healing therapies that work in harmony with the body to stimulate and enhance the body’s own healing mechanisms to recovery from disease and restore vibrant health.” The word “Naturopathy” was taken from the Greek word “naturae,” which means natural or innate, and “pathos,” meaning suffering. Naturopathic Medicine emphasizes the fact that the body has a natural innate ability to heal itself and overcome the symptoms of suffering. Dr. Gemie also explained that the word “Physician,” taken from the Greek root “physicke“ means “the science of nature,” and was used by Hippocrates to remind every practitioner of medicine that “Natural forces are the healers of disease,” and that doctors should “be skilled in Nature,” and teach people how to cooperate with the wisdom of the body. At this time, Innate Wellness & Medical Center is Prescott’s exclusive medical center offering bio-oxidative therapies to include the application of various ozone therapies (prolozone, insufflation, and autohemotherapy), BioPhotonic therapy or UBI (Ultraviolet Blood Irradiation) and hyperbaric chamber services to address conditions ranging from musculoskeletal pain, bacterial and viral infections, respiratory conditions, fatigue, macular degeneration, irritable bowel disease and auto-immune conditions just to name a few. Dr. Gemie has been trained by some of the country’s premiere physicians in order to provide these safe and effective therapies in Prescott. Innate Wellness & Medical Center also offers an extensive line of high quality, well-researched physician formulated nutriceuticals and personalized patient evaluations and education. Wellness check-ups for children, women and men along with various infusion IVs, Prolotherapy®, acupuncture, B vitamin shots and bio-identical hormone replacement therapies are offered as well.